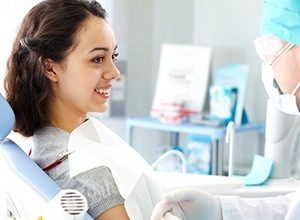 While some patients may be able to comfortably keep their smiles complete, others experience serious problems with their third molars, more commonly referred to as “wisdom teeth.” These teeth are the last to erupt from the gums, and if they’re impacted or there’s not enough room for them within the mouth, it can cause serious pain and damage. If left alone for an extended amount of time, they can cause the other teeth to shift and misalign, and they may even become infected. Eventually, this infection may reach the underlying jawbone, in which case all of your teeth are in jeopardy. This is why we’ll always keep an eye on your wisdom teeth during your regular checkup. Ideally, we’d be able to remove them BEFORE you have to deal with any issues. But, if you start to feel pain in the back of your jaw, we can remove them right in our office with a minor surgical procedure. You’ll be put under a gentle form of general anesthesia, so you’ll be completely asleep the entire time. Are you starting to feel a dull ache in the back of your jaw? It might be your wisdom teeth, and you should get them looked at immediately. Be sure to contact us immediately so we can save you from dealing with more serious problems!